The Dreamcatcher has an open-plan, Indonesian inspired interior. The private deck with BBQ and sun loungers leads to the spa and outdoor shower amongst a intimate garden setting. 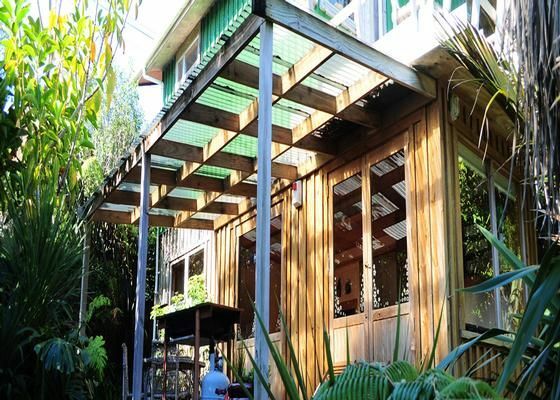 Sit back, relax and listen to the Tui birds on the elevated outdoor sun porch. Just a few minutes walk down the hill and you are at the water's edge at Whale Bay and at the surf breaks of Indicators and Manu Bay. Sleeping Situation: Sleeps up to 4 people with a King sized bed plus a double pull-out sofa bed. However the Dreamcatcher with its open floor plan is ideal for couples seeking a romantic getaway. Not suitable for children under 6 years. Quality linens and towels are provided. Coffee, tea and milk provided. For rainy weekends snuggle up in that jumbo bed... spin the tv around and enjoy all the channels including SKY movies. We may have to send in a search party for you when it comes time to check out. Ngarunui Beach and Wainui Reserve is a short drive away (makes a great walk too). Dreamcatcher guests receive free access to the Karioi Outdoor Centre, located in a 110 acre nature reserve which is located on the next door property featuring a Scandinavian Sauna, sensational viewing platforms, sports barn with table tennis, bush walks and Mt Karioi tramps, free range eggs in the summer months and glow worms at night. Guests of the Dreamcatcher will get a discount for the half day beginner surf lessons and half day board and wetsuit hire with the Raglan Surfing School. Two night minimum booking applies. Check in is at 2pm and checkout at 10.30am thanks. Price is based on 1-2 people. Extras above two people are charged at $35 per person per night. A 20% deposit is required to confirm a booking. Pets are allowed however incur a charge of $30 - there are rules for pets - please enquire if you wish to bring yours. If waking up to a to chorus of Tuis accompanied by gentle waves is your thing, then stay at the Dream catcher. No ocean view but the beach is a short drive and a lovely scramble on a warm afternoon. Everything is provided in this relaxing retreat. Loved staying in this bach that we even extended our stay! The bach was clean, quiet, and spacious with all the luxuries that one needs. It is a stone throws away from town and the surf beaches. Loved it...we will be back! Beautiful place, fantastic gardens and spa. We were underwhelmed with the rustic condition of the property. Uncared for garden setting. Little to no comfort with musty bed linen of poor quality, a king size mattress which looked and felt old and well used and an uncomfortable fold out couch. The property is over priced for what it is. Sorry. We had a wonderful relaxing few days here. Lovely place, great spa, perfect place to relax and unwind. Nice walk down to Whale Bay, and a short trip in the car back to Raglan for supplies. Totally recommend. It was a wonderful place to stay! Very clean, comfortable, beautiful space! Dreamcatcher Lodge is a rear house which can be accessed by its own driveway. After turning left onto Whaanga Road from Wainui Road you will see a steep uphill concrete driveway to the left just after the Karioi Lodge Sign. Head up the driveway and Dream will be the 3rd property on the right hand side. There is a small path leading to the unit just below the garage/Carport. Karioi Lodge and Whale Bay Reserve offer great walks, views and beautiful bush scenery.